I knew this day would eventually come and here it is, the end of the toothpaste tube. As you can plainly see, I pretty much got my moneys worth out of this thing, but at this point I think it's safe to say that that dog won't hunt no more. I actually finished a few days back and I'm just now admitting to it and adding it to the heap downstairs. So what you ask dear reader have I been doing in the meantime? Well, i did a little research on the web and found out that you can actually make toothpaste out of baking soda, salt, glycerin, and water. We had all of these ingredients in the house, so I figured it'd be worth a shot. Well, let's just say it hasn't gone well. While the ingredients above sound oh so yummy, they are not. Vomit inducing would be a bit more along the lines of an accurate description. I've been looking for some other recipes, and consulting with a few dentists as well. It seems that hydrogen peroxide and baking soda are another good bet. I'll be the one with the frothing mouth. What's to be? Well, I'm going to give it a bit longer, but i think on this one, I may end up heading back to the tube and just sucking it up on the toothpaste/garbage front. 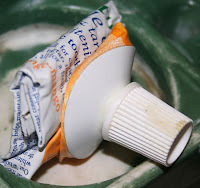 If I can chip away at everything else, I may be ok with landfills filled with nothing but old toothpaste tubes. At least they'd smell good. My wife uses baking soda with toothpaste like hamburger helper. Maybe you can go to bulk club and buy 55 gallon tubes of toothpaste. I had read that glycerin is actually bad for the enamel on your teeth - it takes 20+ good rinses to remove it from your mouth after your brush. How many of us will actually do that?! They are called "Tooth Chips", they are made by a tiny little company and if you buy the larger size (the above link), the package is not plastic. Of course it has to be shipped but so does regular toothpaste and if glycerin is really as bad as I read, you will also be reducing the waste/fuel associated with going to the dentist for self-induced trouble! FYI on the baking soda: I was really sick in December and started eating 4-5 oranges per day. I also was experiencing pain so intense in my tooth that I thought that I needed a root canal. I went to my dentist and they checked it out. They took an x-ray and ruled out the need for a root canal and then looking at my gums near the affected tooth asked me, "Have you been eating a lot of oranges or brushing with baking soda or salt?" I told them about the oranges and their response was that all three cause gums to recede and thus the pain. I've been brushing with baking soda for many months now, and my dentist says my teeth are fine. I don't use glycerin for the reasons that christy b cited. I add a few drops of wintergreen oil and a bit of stevia powder for taste. All of these ingredients I buy from Rainbow Grocery in SF in bulk in my own containers. I like brushing with baking soda. My teeth feel cleaner than they ever have before. I think the key to healthy gums is to use a soft toothbrush and not brush too hard but gently massage the gums. I also make my own mouthwash. My father used to brush his teeth with baking soda. I have no idea why. He was rich. He could have used the toothpaste of kings, which I imagine is something like regular toothpaste, only squeezed onto your brush by a really hot peasant woman. Either way, the answer to the taste problem, obviously, is to add sugar. I also do the toothpaste and baking soda thing- stretches the toothpaste. Straight baking soda is a bit harsh, in both senses, but you do get used to it. Adding a drop of tea tree oil gives you that just brushed feeling. I guess I've stuck to it also because baking soda can be got in those great big cardboard boxes and we use it for about 60 percent of general cleaning...it removes stains from white china, is a great bathroom scrub..antacid..uh oh starting to sound like the back of the box. Interesting. During my last visit to my dentist, the oral hygenist told me I had some staining on my teeth and recommended I dab my toothbrush/paste into some baking soda. She said to avoid salt--it being to abrasive for the enamel. When using baking soda get an aluminum free one. You can also find baking powder that is aluminum free. Drawback: the only aluminum free alternatives that I have found come in plastic. If you do go back to buying regular toothpaste, I would recommend buying the plastic squeeze bottles. These will be easier to recycle than the roll-up tubes. christy b: baking soda has aluminum in it? Anonymous: What makes you think that plastic squeeze bottles are more recyclable than the other types of tubes. I don't know of any company that recycles them. 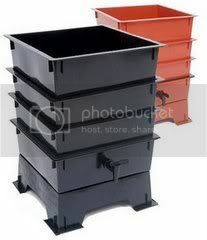 Your town might accept them curbside, but that doesn't mean they are actually getting recycled. I brushed my teeth with baking soda and hydrogen peroxide for years. I would occasionally add some peppermint extract to my toothbrush for flavor (comes in a small glass bottle). Ya do what ya gotta. It wasn't that bad... just got used to it... and my gums were in great shape from the peroxide. I had an idea about reusing your toothpaste tube and it might actually impart some delicious residual Tom's of Maine flavor into your new paste. If you wanted to try making some mixture of hydrogen peroxide and baking soda and mixing it into a paste form (perhaps adding some peppermint extract per the suggestion above), you could hypothetically inject that paste back into the tube. I have this meat marinade injector that would do the trick, or if you have an old syringe (like you'd use to squirt medicine into a dog or child's mouth) sans needle, you could do it that way. Something like this. I guess you'd already have one though. I might try this with my own baking soda-peroxide tooth goop when my next tube flattens out. Can't Tom's of Maine toothpaste tubes be recycled? They have that symbol on them that means steel I think.... I always send them out with the recycling.. minus the cap. I hear that if you use city water, that there is enough flouride that you don't need toothpaste...just brush with the water. Of course, flouride in the public water is a whole other discussion, I'm sure! Kiss My Face makes some pretty decent toothpaste that comes in recyclable (#2) plastic tubes and contains no fluoride or sodium lauryl sulfate. A friend just gave me a tube of this stuff and i have to try it. love your blog, i just stumbled upon it yesterday. very informative and inspirational. i've been doing my part at least on the toothpaste end of the spectrum by using the kind of Crest toothpaste that comes in the little plastic recyclable bottle-like things. i don't know if they address the glycerin problem or not, but the dentist says i have nice teeth! Brushing with baking soda frequently makes your teeth become more sensitive. You should have an alternation whenever you use baking soda as your toothpaste. When you feel sensitivity, go back to your old brand. Just use the two alternately to avoid gum reseeding and tooth sensitivity. Over the past 6 months or so, I have started making my own tooth powders, after hearing similar things about all the ingredients in toothpaste. I imagine there are different recipes depending on what part of the country you're in, and what herbs are available, but I've made 2 different recipes. The first is: 1/2 ground horsetail (grows wild around here), 1/2 bentonite clay (buy at health food store), and a few drops of mint oil.